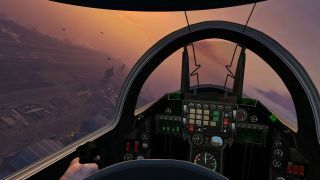 Yesterday we learned that GTA 5 will get a first person mode supported by new animations, vehicle interiors and first person gun models. There's a video of all that now, and it looks really good. Particularly the bit with the bike at night in the rain. The footage is advertising the PS4 and Xbox One version of the game, which is out on November 18. The PC version will support 4k resolutions (though you'll probably need a killer machine to run it well) and is due out in January 2015. I can't wait. I've never cared much for GTA's gangsters, but Rockstar's worlds are remarkable, and full of ways to have fun without even breaking the law.